(Tucson, AZ)─Tickets for Yo-Yo Ma’s first performance in eight years with the Tucson Symphony Orchestra will go on sale Tuesday, September 19 at 10:00 a.m. The cello virtuoso will perform with the Tucson Symphony one night only Tuesday, December 5, 2017 at 7:30 p.m. at the Tucson Music Hall. Tickets range in price from $175 to $75. Tickets can be purchased online at www.tucsonsymphony.org, at the Tucson Symphony Orchestra Box Office, 2175 N. Sixth Avenue or by phone at (520) 882-8585. TSO Box Office hours are Tuesday through Saturday, 10:00 a.m. to 5:00 p.m. Awarded the National Medal of Arts and the Presidential Medal of Freedom, the Kennedy Center honoree and 18-time Grammy®-winner Yo-Yo Ma has enthralled audiences worldwide on stage, recordings, film and television. 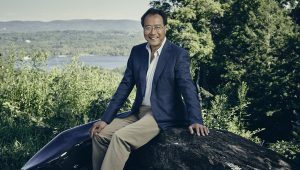 Yo-Yo Ma will perform Edward Elgar’s beloved Cello Concerto with the TSO on a program that will open with Rossini’s Overture to William Tell and include other selections by Delius and Nicolai.